One Sunday afternoon, hubby asked me to cook something. Remembered I had this vegetarian soba in Secret Recipe…and I have most of the ingredients in the fridge. I improvised a bit on the recipe, adding in egg shreds and sausages, taking out the celery and changing the soba to air dried noodles, and some other modifications. Half big red onion, 2 sausages, half a carrot, half a chili and 2 big pieces of button mushroom. All cut into thin strips. Medium fire, heat a table spoon of oil in wok. Saute red onion til soft, add sausages, fry for half a minute, add carrot, chili and mushroom. Cook until they wilt slightly. Off the fire. Cook 2 pieces of air dried noodles (I used Cintan, you may use soba if u like) in boiling water. Drain. Seasoning : 1 tbsp light soy sauce, 1 tsp sesame oil, 1 tbsp onion oil. Toss everything together. Cut 2 leaves of lettuce into strips and toss in. Lettuce is in last, to make sure they remain crisp and uncooked. It looks like fried noodles, but doesn't smell like one. If one likes the noodles in Secret recipe, one will enjoy this too. During last year's class party, my student Ng Kher Chee brought this amazingly pretty jelly... It was dyed bright pink like magenta, dotted with some black seeds. She told me, it was made with the red dragon fruit. 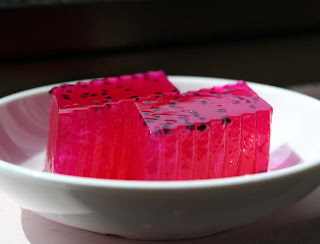 I call this pink dragon fruit jelly, because it looks more pink than red.... wonderful colour. I like eating the fruit raw, making it stain my lips with a pretty tint. Hehe..so vain..
2. Mix the sugar and agar powder together and pour into the boiling water. Let it simmer for 5 minutes. 3. 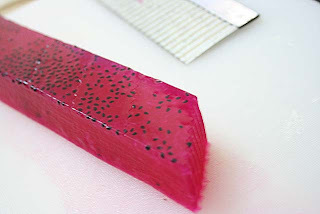 While simmering, mash the red dragon fruit with a fork until it becomes a puree. 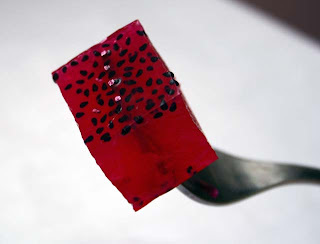 Don't use a blender as we want the seeds to be visible in the jelly. 4. Turn off the fire and pour in the dragon fruit puree. 5. Stir and pour into prepared mould. 6. Wait for it to cool down and then chill in the fridge. Actually this fruit isn't much aromatic nor does it have a distinct taste..but nontheless, it's the colour that is really pretty. I think I may do this jelly again, with some modifications on the flavour. I don't know why the camera cannot capture the real colour that I saw with my own eyes, it's more reddish rather than pink... a bit dissapointed.. 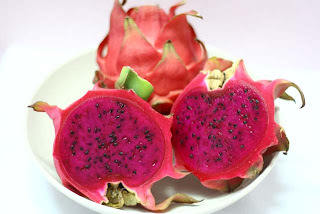 The seeds of the dragon fruit tends to settle down on the bottom. I cut the jelly bottom side up to get a nice outlay of seeds. The picture's reddish, I don't know why..but the seeds do look pretty .. 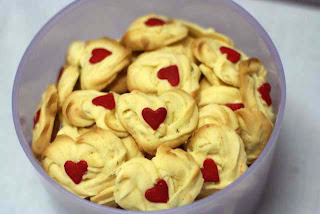 When I was a small kid, I love the peanut cookies that my aunts (maternal side) made. 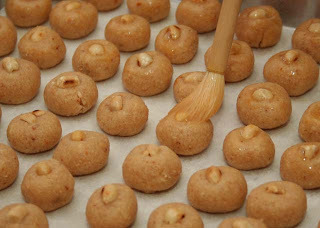 Every Chinese New Year, my brothers will look forward to their kuih kapit, but I am waiting for the peanut cookies instead. The traditional recipe calls for lard, but thinking of my mother who has hypertension, better not. Changed the tasty unhealthy fat to corn oil. So, it's not-so traditional already. It's not as soft, but still it's soft enough to be scarred and chipped by fingernails. So better be careful when transfering them. Many scarred ones went into my mouth and my hubby's mouth... It still melts in the mouth. Yummy yummy! This is my first attempt..hehe. 1. Mix flour, sugar and peanuts until well blended together. 3. 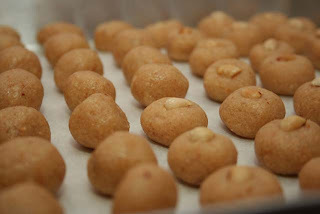 Take a small amount of peanut dough onto palm and roll into a small ball the size of a marble. 4. 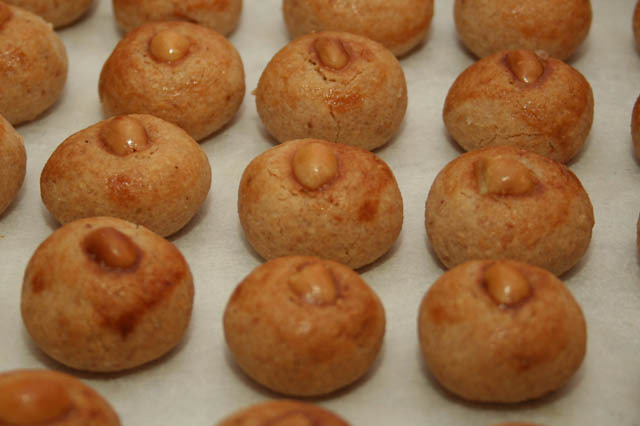 Place the peanut ball onto a baking tray and place a peanut half onto it. Lightly press the peanut half. 5. By using a chinese calligraphy brush (mopit), glaze the peanut ball with a beaten egg. 6. Bake at 180C for 12 minutes or until the egg glaze turns golden. Tada!!! Nice and golden. Hubby can't wait to pop one into his mouth! I made about 550 pcs of peanut cookies with this amount of ingredients. Cost? Around RM11 only not inclusive of electricity of course.. Cheap hoh!! But darn lot of work, especially preparing the peanuts:- roasting, deskinning, airing and grinding!! One afternoon for the peanuts, one for the cookie. 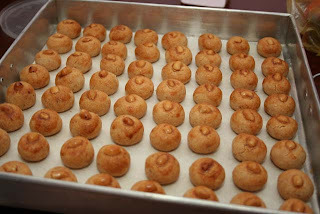 2 afternoons to make 550 pcs of peanut cookies. Quite time consuming actually, but if one has the time, can save a lot of money instead of buying them at RM15-20 for 100 pcs. 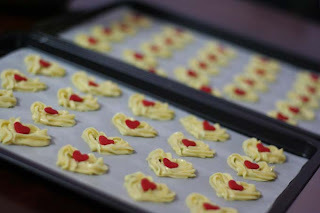 I'm making this again next weekend... cos I don't think what I made today is enough to be shared among my relatives. 2. Use store bought roasted peanut nibs. So, roast your own peanuts (those with skin) and do not reduce the sugar. If you do reduce the sugar you need more oil to bind the dough. So choose, oil or sugar, up to you to keep the dough intact. If you prefer floury, fine peanut cookies, mill the peanuts together with the flour, this way your peanuts will be as fine as flour. Then use icing sugar, but reduce it to about 750gm (icing sugar taste sweeter), then you will need more oil, probably, 500ml or more. Gauge it as you form the dough. If you want a really melty peanut cookie, that doesn't need any effort to eat, use LARD (pig fat), or GHEE. 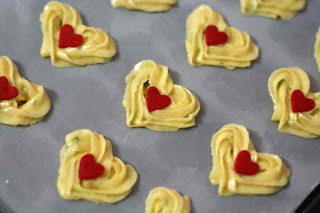 I had this idea of creating a melt in the mouth cookie with a strong citrus taste. This is the first attempt. I like them a lot..... but my hubby who doesn't like sour stuff find them not so appealing. He asked me to substitute the taste, but retain the texture. Sift 150gm corn starch, 50gm superfine flour, 1 tbsp custard powder and combine with (B) until smooth. 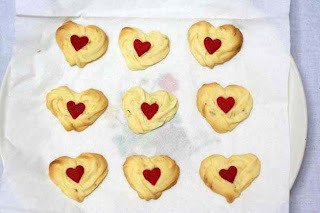 Pipe out heart shapes and decorate with a sugar heart in the centre. Bake in a preheated oven 180C for 7 minutes. Try not to brown the cookie, and if the cookie base is not totally dry from the baking and cooling, place cookies overturned in a flat plate , microwave on medium for 1 minute or 2. U'll get crispy cookies after that. The centre piece was nice and not browned, I baked it for 6 minutes, and microwaved on med for 1 min. The other 8 surrounding the fair one was baked for 7 mnutes. What is amaranth? Some Malaysians may not know. What is bayam? We know. 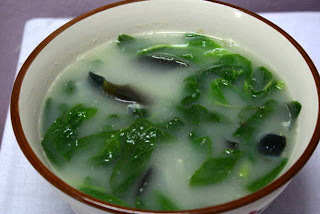 For those that can understand cantonese, what do u think is spinach then.....? In Cantonese Spinacia oleracea is Por Choy, and edible amaranth is Yeen Choy, Kangkung is Ong Choy and not forgetting Malabar Spinach is Charn Choy or Tai Wong Choy too. For those that cannot understand cantonese, just a look at the scientific name and make ur verdict. Ok, enough said about spinach. This page is about edible Amaranth. It does look a bit murky, due to the century eggs. My hubby loves this soup. 1. Heat a saucepan, put in oil and saute the anchovies for a while and put in water. Boil, cover and turn low heat simmer for at least 15 minutes. 3. Put in trimmed Amaranth and boil for a minute or 2 depending on size of plant, baby bayam will need less time. Add salt and taste. 5. Place soup in a bowl and serve.